Will the Bullet Journal Help You Become More Productive? Who’s got time to do that every day? I wrote bullet journaling off as not for me. I predicted that my friends would drop bullet journaling within a few weeks. I also predicted that bullet journaling would fade. Later in this post, I’ll dive deeper into each part of the Bujo system. But all you need to start a bullet journal is a dotted notebook and a pen (Muji pens are my favorites). Because of this, the biggest advantage of using a paper journal is that it doesn’t have a gazillion apps fighting for your attention. If you need to check what you need for your next class, you open your notebook, look up your schedule, and get right back to what you were doing before. The Bujo also helps you take notes faster, while keeping everything in one place. No more piles and piles of post-it’s, planners, digital tasks, and Evernotes — all of your stuff will be in one notebook. Finally, your Bujo will also help you prioritize and manage your time. Because you’ll have to manually rewrite tasks if you don’t get them done, you think twice about how important the task is. If it’s not worth the time to migrate to a different day, then don’t do it. It wasn’t important enough to do in the first place. Now you’re probably wondering how exactly a paper journal can help you do all this when there are digital productivity systems and custom made planners out there. You might be wondering what these notations mean. In the next section, I’ll go into more detail by showing you they come together through another element of the bullet journal: The Daily Log. With the rapid logging notation, you can quickly take down tasks and details in each day without resorting to longhand. The Daily Log is a day-to-day container for the rapid-logged tasks you have to do for the day, including what other to-do’s, ideas, and events cropped up during that day. 1. Write the date at the top of the page. This is useful when referring back to the log at a later date. 2. Use bullets “•” for tasks and dashes ” –” for notes. Notes can be standalone thoughts and ideas or they can provide detail on a task or an event. 3. If a task has subtasks, you use an indented bullet underneath the original task. Make sure to take my time! You can only X the bullet if you’ve finished all its subtasks. If you don’t need to do the task anymore, feel free to strike it out. Pat asked for my number!! 6. For important tasks, add an asterisk “*” before the bullet point. If the idea is an inspiring one, add an exclamation point “!” before the bullets “•” and dashes ” –” . 7. At the end of the day, you do a daily review. This is when you sort through the tasks you wrote down, migrate them to your monthly log, a collection, or your future log (more on those later). The Index occupies the first 4 pages of your Bujo. It’s a list of all the collections you have in your journal, plus their page numbers. If you’re just starting, the Index will only have your Future Log and Monthly Logs. If the collection exceeds the initial number of pages you allotted for it, then you can continue the collection in another set of pages, marking down the new set in your index. I also use a technique from The Bullet Journal Method called threading (no, girls, I am not talking about eyebrows here) to avoid constantly flipping back to the Index to look for the collection I want. The next 4 pages in your bullet journal are your Future Log. Each page is divided into 3 months and contains the tasks and events for that specific month. The Future Log contains all of your to-do’s for the next year outside of the current month. Ideally, you should only check this once a month when you create a new Monthly Log for the coming month (more on this later). If you started your new bullet journal in October, your 4-page Future Log would start with November and end with the next year’s October. The Monthly Log is a middle ground between the nitty-gritty of the Daily Log and the bird’s-eye view of the Future Log. This collection is the one I access the most. Later I’ll show you how I use it to keep track of my daily habits, too. In this section, you can note important events that are coming up in the month, including past events in the month that you want to remember. Later you’ll see how I’ve modified this page to track recurring tasks. This is the page you’ll check every day for tasks to add to your Daily Log. You’ll also migrate tasks from your Daily Log to this section. My tasks tend to bleed into another 2 pages, but if you’re a sane person, you’ll only need one page for your monthly tasks. Aside from the basics of the Index, Future, and Monthly Logs, you can also create custom collections to help you track other areas of your life. There are templates online for project trackers, schedule spreads, and funky calendar views. During the evening review, you go through your tasks for the day: crossing out tasks you finished, striking through ones you no longer have to do, and moving new into collections like your Monthly Log, Future Log, and Custom Collections. Yes, these reviews are more work. A daily review usually takes at least 10 minutes for me on weekdays. A monthly review takes at least an hour. But this is because I’m sporadic with my reviews. I do daily reviews 3-4x a week, with one weekly review on Sunday nights. This way, my monthly reviews take less time. You don’t have to do it this way though. Just know that the more frequently you do the daily reviews, the less time each review will take, including the monthly review. If you got to this point, congratulations! All those steps and details might seem like a lot of work. The beauty of the bullet journal is in its simplicity. But what really got me into bullet journaling was having different collections for different areas of my life. I have one for sports, one for my business, and one for my writing. I love the feeling of having everything in one place that I can access quickly via the Index. To maximize your brainpower for learning material, block off everything that needs to be done on a weekly basis. Don’t just block off your classes. Include your gym time and study time, too. I don’t use a time-blocked daily log these days. But when you have feel overwhelmed, a time-blocked daily log can help quiet the anxiety so you can work. Add a bullet point to each empty box. Cross it out when done. 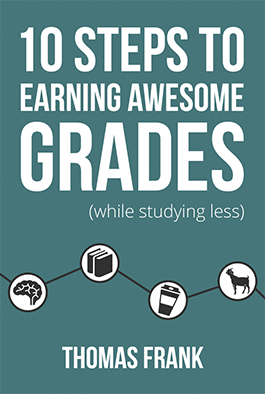 This way, you’ll know what to work on for your next study session at a glance. That said, I wouldn’t keep my class notes in my bullet journal. I don’t want to flip back and forth so much when I study. The Monthly Log befuddled me when I first started bullet journaling — what’s the use of a monthly log when I use a weekly one? Earlier I mentioned that I the Monthly Log is the collection I use the most. This is because I use it for tracking habit streaks and important-but-not-urgent tasks. Habits are signified by a letter. Each time I do it, I put an X in the box. Seeing my habit streak helps me stay motivated. You can use a similar single-letter signifier system to remind you of recurring tasks, like a weekly assignment you have to hand int. I work off of the weekly view for the most part and use a Daily Log page to capture tasks and notes that come up during the day. Remember, anything worth doing is hard. An offline productivity system like bullet journaling takes more time than a digital productivity system or an app like Todoist. Bullet journaling takes work to learn and maintain. Think about it, though: During your reviews, if you strike out tasks that are so unimportant you don’t even want to migrate them, then didn’t you just save time and energy? Or what if you feel calmer during the day because doing your daily review means you’re on top of all your school and extra-curricular projects? Isn’t that worth more than saving the 10-15 minutes you use for the daily review? Convenience and time saved shouldn’t always be the metrics we use to measure our productivity. Many times the intangible metrics, like more peace, better concentration, and more energy, are the ones that will ultimately make us more productive in the long run.